Mimi said Jacob is hot, but for what its worth, he can't act his way out of a paper bag. Saw him on SNL and he bombed miserably. In other news, I had a stretch armstrong action figure. I loved that thing more than I ever did my Marie Osmond Barbie Doll. Taylore Lautner is so hoootttt! i love him. I can't wait for this movie! it's definitely going to be hit! And by Jacob, I meant Taylor... bleh, sorry Mimi for the mix up. But the paper bag thing still stands, LOL. 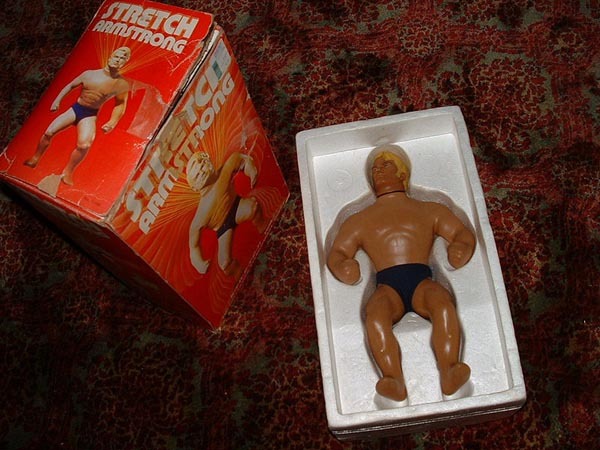 I totally remember Stretch Armstrong. Excuse me while I go wipe the drool off my chin from having stared at Taylor Lautner's photo for just a minute too long. Tsk....it's a good thing he's 18 now...or I'd be a pervert! I had tons of toys when I was a kid. However Stretch wasn't one of them. ... btw, did I ever mention I used to look JUST like Taylor when I was his age??? People tell me that all the time. I remember my mom buying one of those at a yard sale years and years ago… I never knew that he had a team, and villains to battle with. When my son played college football he won the Stretch Armstrong award. Even came with the doll of the same name. Him and some of his frat brothers had fun stretching it until it did pop. why on earth are they making a movie with Stretch Armstrong?! HAHAHAHAHAHAHAHA! You are way too hilarious! I'd love to think the way you do, just for a day. It'd be a trip! My cousin had one of those dolls...I agree with MiMi! He is a cutie for sure! For some reason my parents never let me own Stretch. Guess it was an awkward scene with me crying to 'em, begging for a rubber guy in a speedo. No comment about the Taylor selection. I guess it's just me, but I think Taylor has odd facial features, and is too girly to play a character like Stretch. This is definitely a memorable one. Looking back, it is an extremely weird "toy." Isn't it? I'm sure Taylor will earn the company millions when they put out a new version in his image. It's just a matter of time. Thanks for visiting Lucy & I, we're returning the visit. I'm also a big fan of Judy Blume, those were great books to grow up with! Visiting and following back from Friday Follow. Thanks so much for stopping by!!!! Stretch Armstrong's Speedos are more modest than Taylor Lautner's jeans. Lautner seemed more appealing in the first Twilight movie, when he was just a nice, normal, covered-up Indian kid. Great blog! Thanks for following us- following you back! Thanks for following Mommy Time Out! Following back. Hilarious! 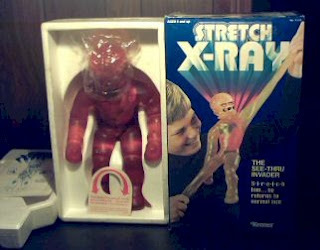 Yeah, we definitely need a feature-length film about an elastic toy from the '70s. Way to go, Hollywood! That should be an interesting movie. Why does everything have to be in 3-D now?